Just the door speakers. I’m assuming the tweeter and mid speakers share the same channel. I really don’t want to get involved with tearing into door panels and removing tweeters, installing crossovers, etc. I’ve done all that and have been unhappy ultimately. As mentioned earlier by @shrykhar , plastic pry tools yo. 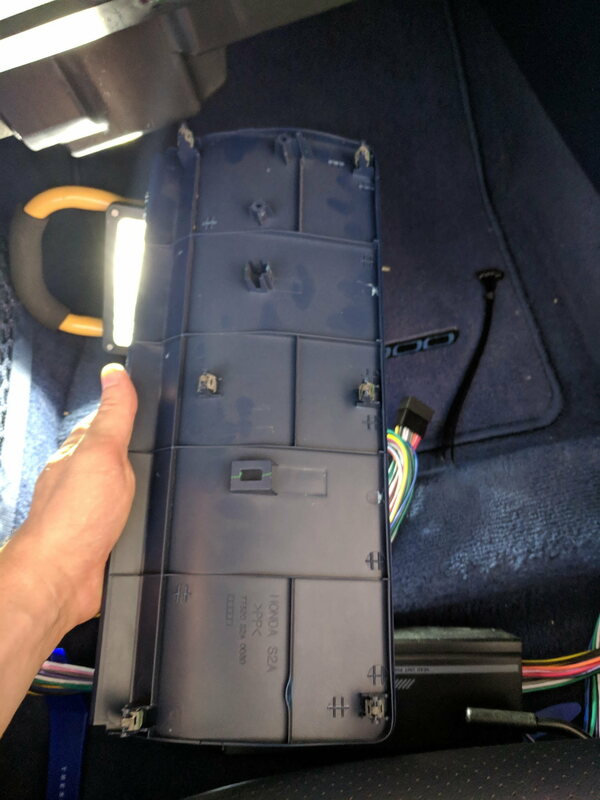 I just removed the interior vent/radio door piece with zero issues. The key for me was to preach patience. Nevermind that my recently purchased car is approaching 18 years old, I had no idea of the state of the plastic clips and tabs that I'm about to undo. So, I took my time going from one corner to the next. My pace was literally in terms of millimeters, and then centimeters when it came to prying the piece out. If I see it budge a little, cool, move onto the next corner/side. Get a kit with multiple pieces of pry tools, so you can jam one in, nudge it a little, and keep it there to hold the position. Use another pry tool on another corner/side and nudge there. I just got done getting the access panel off too to install my KTP-445A. I found that contorting my body so my head was under the dash and pinching the clips and pushing them out from the back side worked for me. It definitely wasn't easy and I worked up a sweat, but I was able to get it off without breaking anything. The KTP-445U is definitely the way to go, as mentioned above, since it can be bridged to run the front pair of speakers. I have mine running off my Alpine headunit RCAs, gain at about 30%, to Polk door speakers. I can turn the volume to nearly max with no distortion, though I've also set proper LPF with a roll-off around 80Hz. It easily gets uncomfortably loud, and I don't usually go higher than 25/26 out of I think 35 on the volume. Paired with the self-powered sub I have behind the driver's seat, the system sounds amazing for the ~$600 I have into it. If I recall I had everything setup properly. I even made a custom harness coming from my headunit to adapt the inputs to RCA for the KTP-445U. If you had to custom wire something to adapt to the RCAs, it sounds like you're using speaker level outputs from your headunit. It should be RCA -> RCA. In addition to the tips above, make sure the plastic isn't cold when you're working on it. Cold plastic will be a lot more brittle and harder to remove without breaking things. If needed, use a hairdryer or heatgun to heat things (be careful obviously, don't melt anything) and it should be a lot easier to avoid breaking plastic pieces. Hey guys, I installed a KTP-445A and am disappointed that it didn't make as much a difference as I thought it would. I can barely tell a difference to be honest. Made a huge difference for me but I dynomatted the doors and door panels. I'd suggest you do the same and the bass will come alive!